Anna's mother doesn't have much money, but what she lacks in funds she makes up for in love. Anna knows her mother treasures her and she feels wanted and content. However, Anna's luck doesn't last long because her mother dies when Anna's only nine years old. Her brother tries to raise her, but he's an addict and it doesn't take long before he passes away as well. After a short stay with a cold hearted aunt Anna ends up in care, she's all alone, but promises herself she'll one day start her own family with children she loves as much as her mother loved her. She writes to her future children several times a year and loves them before they are even born. Anna starts her adult life alone, but slowly friendships and relationships are becoming part of her world as well. When she meets Theo she knows she's found the one, but Theo is a complicated man. Theo's family has plenty of money, but his upbringing was chilly and loveless. Because of the difficulties in his early life Theo thinks he'll be a worthless father. Will staying with the man of her dreams mean Anna has to give up her biggest wish? She and Theo love each other very much, but will love be enough for them to make it as a couple? 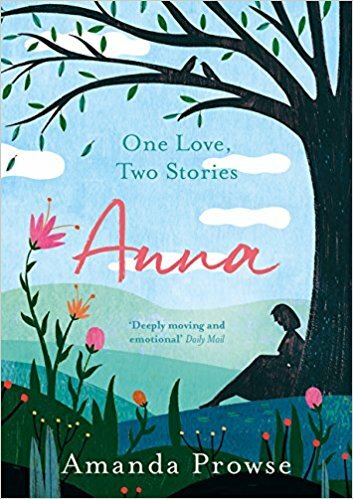 Anna is a beautiful moving story. Anna's early childhood is ideal with much fun, plenty of love and many wonderful games. Anna can be herself and her mother is a true angel. Unfortunately Anna's mother dies way too early and Anna has to learn to take care of herself. She cherishes the days she had with her mother and remains positive even when life is incredibly tough. Anna is strong, capable and loving and she's a joy to be with. She's perfect for the troubled Theo, if only he'd open up. The walls around his heart aren't easy to break down and they're having a tough time together while they love each other deeply. I was curious to find out if they'd be able to make it and couldn't turn the pages quickly enough. Amanda Prowse skillfully describes emotions and that makes all of her stories impressive. She manages to get to know her characters through and through and the reader gets the chance to become really close to them. It isn't hard to care about them after that and that's what I enjoy the most about her books. That includes Anna, I was genuinely interested about what would happen to her and loved each gorgeous layer of her story. The ending has made me extra eager to learn more about Theo and I really like the idea of a double love story. Anna is an excellent start of a fantastic duology and I can't wait to read Theo's half. If you love emotional love stories you don't want to miss Anna. Keep in mind that this book deals with some difficult subjects like growing up in care, addiction and having a desire to have children that isn't easily fulfilled. My Mum has been talking about this book. After reading the review it sounds pretty good, which is weird as we usually like totally different books. Sounds very intense, but also lovely! Looks like an amazing story! I so hope I'll get a chance to read it. The reviews are fantastic (I've read a few). My mother is my best friend and I talk to her most every day. This sounds like a lovely story and I would love to read it! I love the idea of writing to your future children. Beautiful! How lovely. Gorgeous book cover. Lovely review! Sounds reaylly interesting. This is the best kind of book. Complete opposites working on things to fit together. I find my own childhood somewhat displayed in the description. Great review, thank you for sharing this book, it sounds like a very emotional read. Seems like they both have complicated relationships. I'd like to read how they are making it work and how Anna and Theo's personality grow from their childhood and along their relationship.